DoingTimeWithBernie.com: Does Ben Carson want to have his name linked with the corrupt cop Bernard Kerik? Does Ben Carson want to have his name linked with the corrupt cop Bernard Kerik? 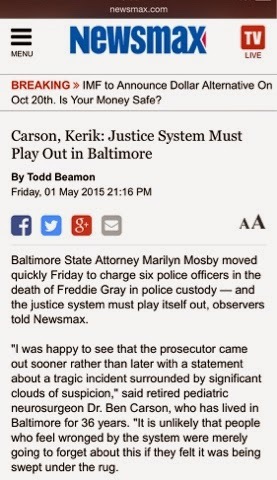 Does Dr. Ben Carson want to have his name linked with the corrupt cop Bernard Kerik? Well a rather deceiving headline posted by Felon liar Bernard Kerk's buds over at Newsmax.com hope you don't look too closely! The headline makes it appear conservative Presidential hopeful, Dr. Ben Carson, shares views and opinions with corrupt liar felon on probation, Bernard Kerik, but nothing could be further from the truth! Perhaps Newsmax thinks we are all high school dropouts with GEDs and degrees "awarded" to us like thug, Bernard Kerik. Sorry, Newsmax. Busted!